When training for field hockey, ensuring that the player’s agility is fine-tuned is a must. And to do this you can practice three elements such as lateral movement, cutting and pop & burst. All of these together would make for a highly effective training session for all abilities. For all of these activities you would need to strategically place cones on the field and have members take it in turns completing the course, which means by having all three of these ongoing at once like a circuit training exercise. Lateral movement will see players faced with cones in a cross shape with one in the centre. They will start at the bottom cone and dribble the ball forward to the middle, then side shuffle to the cones on either side. And then finally burst forward to the top cone, go around it and come back down to the starting point. The cutting technique would have the cones placed in a W shape with the player starting off in the far left. They would then need to run to the cone diagonal from them before pulling the ball around the W shaped cones and then speed up to the finishing cone. And finally, the pop and burst activity sees cones placed in an arch with one at the top, three both sides and two at the bottom. This pyramid shape would require players to start at the top cone, dribble down to the first block of three and use a lifting element to get the ball over the cones to get to the last cone. And then return back to the starting point and go down the other side. 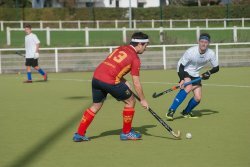 In field hockey there are two main ways in which players can pass the ball from one another and practising both the pushing and hitting elements will better your team mates accuracy and confidence during play. The push pass is where you essentially push the ball along the field with your stick but at such a force that it continues rolling down field. Whereas, the hit pass is where you stop the ball gradually once passed it and hit it hard to send it speeding off across the pitch. Both of these passing techniques can be carried out solo or with a partner who will trap the ball before returning it using the same element as their partner. And part way through the exercise they can alternate between hit and push to experiment with their receiving as well as passing skills. 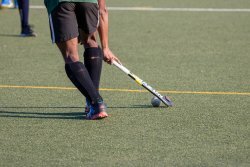 The term ‘trap’ in field hockey actually means to effectively stop the ball in its path. Therefore, by introducing this element into your team’s training regime, they will be able to alter the game play by intercepting the opposition’s passes and improve the hand eye coordination of the goalkeeper. A way in which you can use this exercise is to get players to pass the ball between one another stopping it in between each pass. This stop can be with the flat bottom of the stick or can be performed by laying the stick parallel to the floor. Once you are confident in the stopping head-on regime, you can also up the level of practice by getting players to stand to the side of one another when shooting. Therefore this will be able to improve their initiative and awareness on the field as the ball can come towards them at any direction. Just like running relays you practised on sports days in schools, adding the aspect of dribbling into the exercise is sure to improve the players speed when in possession of the ball. The aim of the game is to have two players race to the next while dribbling the ball and pass it to the next player in line who will continue the dribble back to the finish line. This exercise can also be customized for each level of your players, for example if you have a more advanced group of players in a grouping you can start to add obstacles which they need to dodge before passing the ball to the next player. You can also practice regular dribbling between cones on the field rather than with the added race between fellow players. This type of exercise is more catered for those who wish to train in their own time at home and don’t have access to other players to train with. No matter what their position is on the field, every player should have some level of experience with shooting. This is because it not only focuses on the accuracy and speed of the goal scoring but it also works on their hitting and pushing skills in general which can be used in passing. An example exercise you could use is known as the tomahawk or reverse stick hit. This exercise involves the player being low to the ground and hitting the ball using an axe-chopping motion with the curved back of their stick. This is a fantastic skill to learn for the offensive players but can prove to be difficult to master, so is most certainly something that will need a lot of practice to perfect. Ensuring that the focus will remain on the ball when in possession, keepie uppies are the perfect way to instil this skill into yourself or your players. Keepie Uppies is a training drill technique where you bounce the ball on the end of the flat side of the hockey stick and aim to remain in control without dropping the ball. This also allows you to focus on the weight of the stick and the ball and is a great way to improve concentration and hand eye coordination. A great way to improve the player’s accuracy when shooting is by using the ‘hit the cone’ move. This technique helps to identify who the strongest and most accurate scorers are and who needs to work more on their aim. To perform this drill you would need to place a cone in the goal which represents an open slot between the keeper and the goal. This cone can also be moved various times throughout the exercise to emulate harder shots. And the aim of this exercise is to get the player to hit the cone with the ball. Like the game you used to play in the school grounds when you were little, piggy in the middle is a fantastic way to practice passing. One player would stand in the centre of the circle of their team mates and intercept the ball once passed in their direction and hit it back to a player in the circle. When testing this technique with your group you would need to ensure that the piggy in the middle is swapped out regularly to make the exercise fair on all the players. Improve Your Field Hockey Skills Today! By practising all of these moves mentioned above you will be able to improve your hockey skills in no time. So if any of these exercises have inspired you to switch up your regime or integrating them into your training plan for your team, then let us know. You can find us over on our social media pages and get in touch. You can also shop our fantastic range of field hockey accessories over on our online store – Sports Fitness, which you can use to stock up your team’s equipment or your gear at home.